Kristen Phipps (United Stated, 1993) is living in Columbus, OH as an Ohio State MFA candidate. 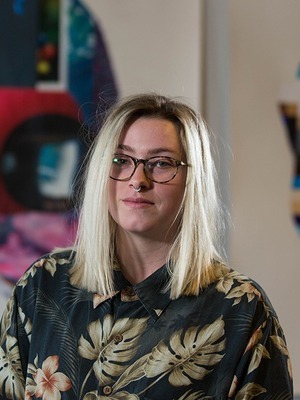 She received a BFA in painting from the Savannah College of Art and Design and an AA from Cowley County Community College. Recent exhibitions include "GHOST" at Harvester Arts, "STAY: a year a year a year" at The Alzheimer’s Association Gallery, and "Aluminum" at Demo Gallery in Wichita, Kansas. Recent group exhibitions include "The Hispanic Society of America Exchange" at The Millworks in San Antonio Texas. Her work has been included in the Gathered Gallery, February 2018 issue of Wichita Magazine, and reviewed by SCAD District, and Savannah Art Informer.